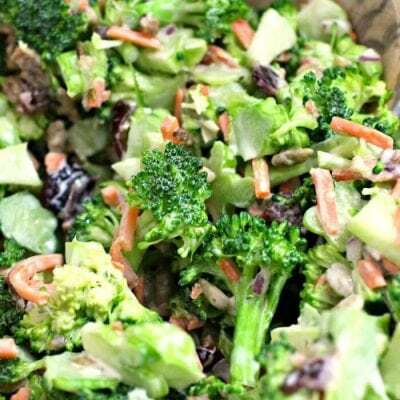 Broccoli salad made with fresh broccoli is the perfect side for dinner or bring it to your next potluck! Broccoli salad has been on my mind lately! I think because it’s a million degrees and the thought of turning on the stove to make roasted broccoli sounds like an awful idea. Also because broccoli salad is deeeeelicious. 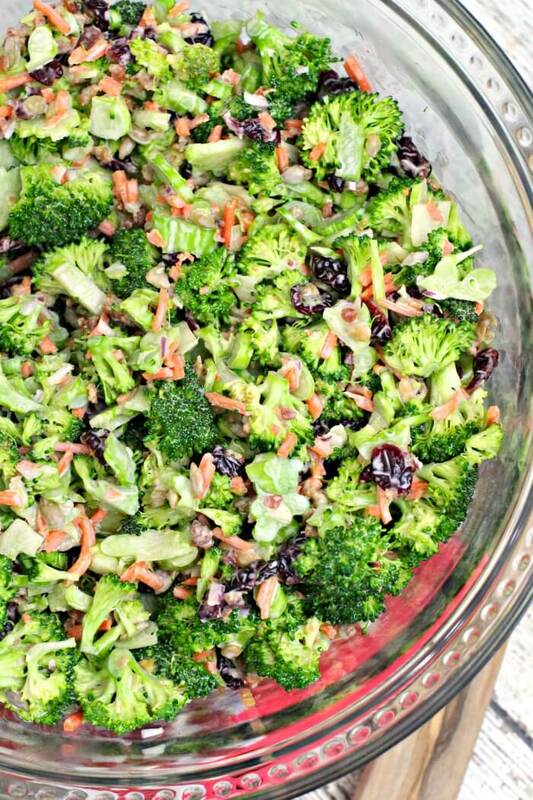 We like to bring this broccoli salad along with homemade mac and cheese, macaroni salad, and peanut butter cookies! 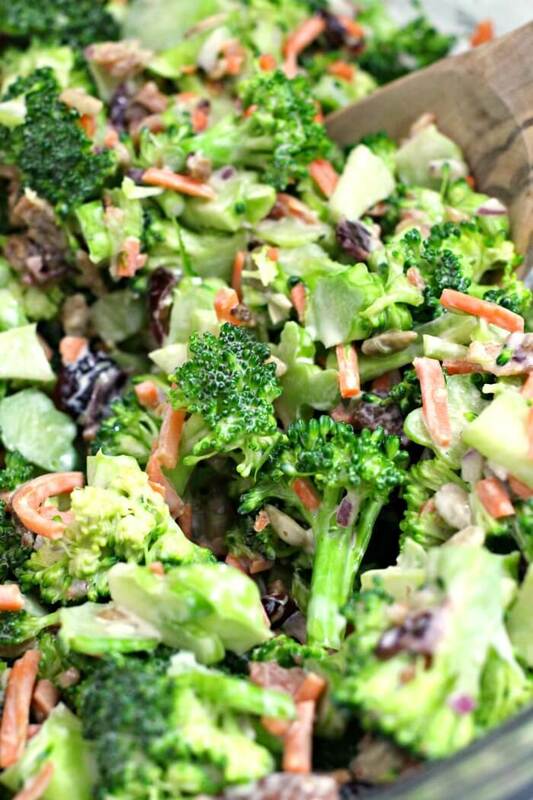 Broccoli – always use fresh broccoli for broccoli salad. I like to chop the florets small and slice the stems thinly. Don’t waste the stems, they’re great in this salad. Carrots – super fine julienned carrots work perfectly. You want them to add a punch of color, but not an overbearing flavor. Bacon – I like to warm the bacon up in the microwave right before adding it to the salad, so the flavor mixes throughout the broccoli salad better. Dried cranberries – If you can find dried unsweetened cranberries, that’s ideal, otherwise Craisins or low sugar Craisins work well. Sunflower seeds – sunflower seeds or pumpkin seeds (pepitas) add the perfect amount of salty crunch. Mayonnaise – I’m a huge fan of full fat mayo, but if you’re looking to lighten things up low fat mayo will suffice. Just don’t use Miracle Whip! Honey – most broccoli salad recipes use sugar to sweeten the dressing, but I think honey tastes so much better. We only add a little bit, this isn’t dessert! Dijon mustard – just enough to balance the sweetness of the honey. I prefer smooth dijon mustard for this recipe as opposed to the stone ground. Soy sauce – whenever possible I like to use soy sauce in lieu of table salt because it adds the salt but also a delicious umami flavor as well. Red onion – don’t skip this, I know a lot of folks don’t like onion, but you only need a little to round out the flavor of the broccoli salad nicely. Broccoli salad is traditionally dressed with a mayonnaise based dressing. Ours also uses dijon mustard for spice, soy sauce for some salty umami, and honey for a touch of sweetness. Many broccoli salad dressings are loaded with sugar, but we prefer to sweeten our broccoli salad only slightly with just a touch of honey. And it’s delicious! Can Broccoli Salad be made ahead of time? 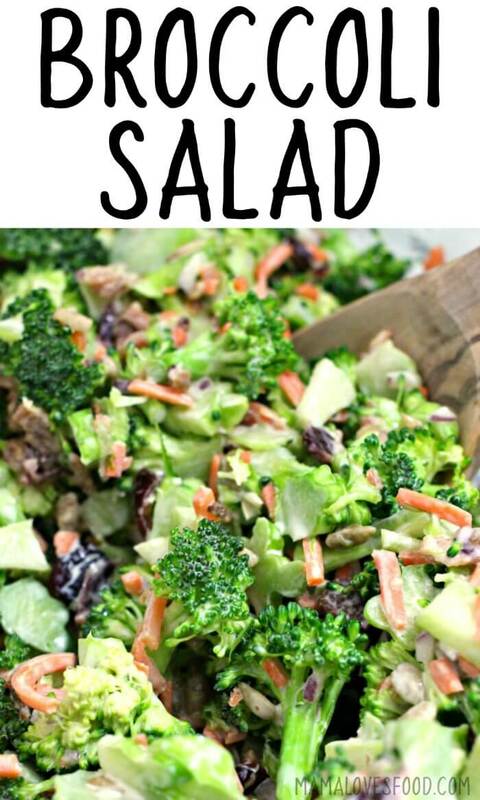 Broccoli salad can be made ahead of time. Not only can it be made ahead of time, but I actually think it tastes better after the flavors have melded in the fridge overnight or at least for a few hours. How many calories are in a cup of broccoli salad? 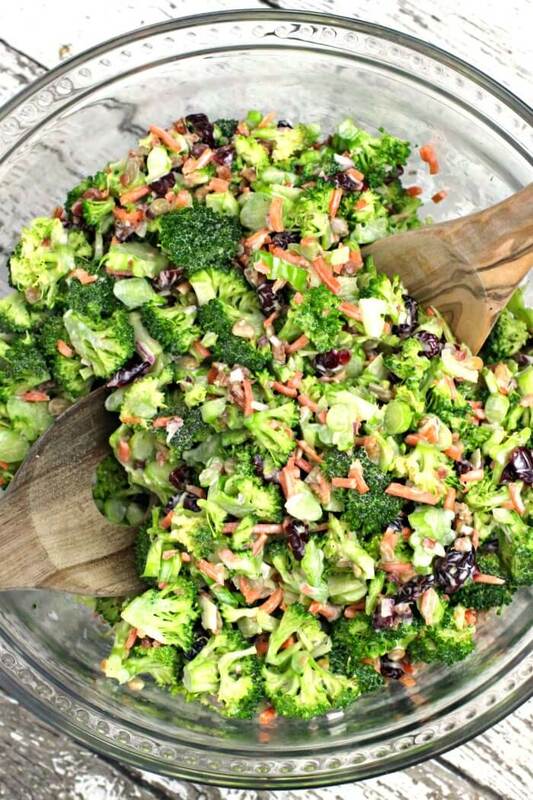 There are approximately 165 calories per 1 cup serving of this broccoli salad when using full fat mayonnaise and low sugar Craisins. If you’re doing Weight Watchers and looking to make this broccoli salad lower in points, try using low fat mayonnaise and apples instead of dried raisins. As written the recipe is 8 points per serving, but with the modifications it’s only 2 points! Knife sharpener – Let me tell you about this knife sharpener! I won it at a conference almost ten years ago, and I still use it several times a week. It’s one of my go-to housewarming gifts and everyone I know just loves it. In a large bowl combine broccoli, carrot, bacon, cranberries, and onion. In a smaller bowl whisk together mayonnaise, honey, mustard, and soy sauce. Pour dressing over ingredients in large bowl and toss well. Calories are calculated using full fat mayo and low sugar Craisins. Healthy alternatives: try using low fat or fat free mayonnaise, and apples instead of Craisins! This will bring it down to 2 Freestyle WW point per serving! 1 serving is about 1 cup, recipe yields approximately 12 cups. I have made this salad several times. It is a hit always. This is my kind of summer side! 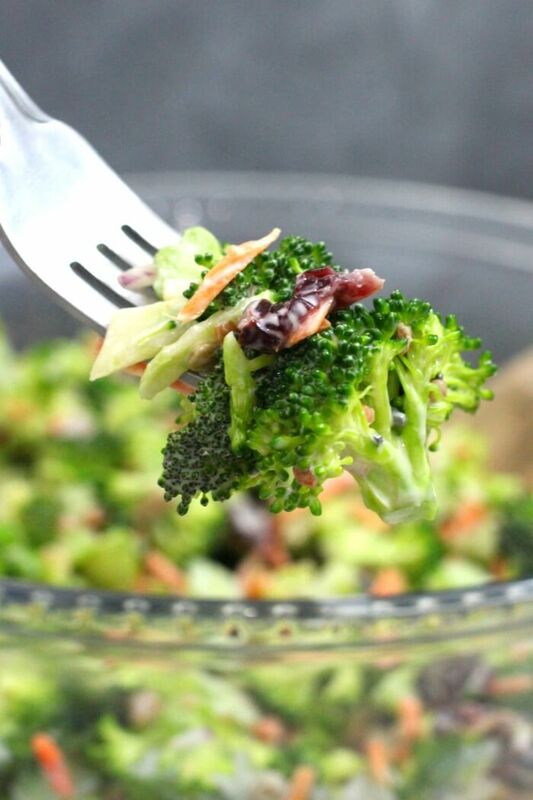 Raw broccoli is one of my fave veggies, and I’m loving the dried cranberries in this – a tiny bite of fall in a fab summer salad! Honestly, I could make a meal on this delicious salad. I would just add some chicken or turkey and call it dinner. What a great recipe….and with grilling season here, you can’t have too many salad recipes to fall back on. I made this the other day. I had to use chopped walnuts, as I didn’t have the sunflower seeds. Even with the change, the recipe was a hit. Thanks for sharing. I also like the idea that another reviewer had of adding chicken and making dinner out of it.